Jenny Jen42: Virtual Trunk Show TOMORROW!!!! 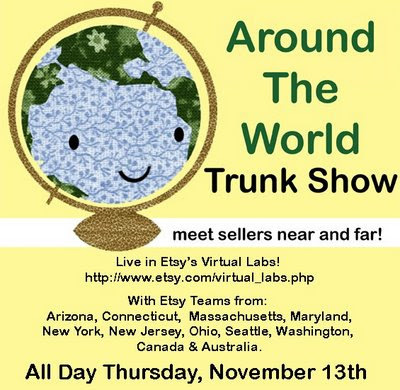 BEST will be part of this virtual trunk show, tomorrow, November 13th, starting at 7 pm. Stop in and check it out! Participating members will be offering 10% off purchases in their shops from 7 - 9pm EST, and anyone who makes a purchase during this time will be entered in a drawing for a goody bag by BEST members. You must have an Etsy account to participate / purchase, but it's easy and free to sign up, and really, you should have one!